We are happy to share the latest releases in September. We had a lot of them! The new program offers bigger commissions and better transparency. From now on the commission from each sale is 30%! And the Partner’s account is already available to all SE Ranking users, so you do not need to register in other systems – everything is processed on one platform. The new Affiliate Program brings a lifetime recurring revenue, which means when a visitor clicks on your affiliate link and registers for a trial we remember him forever. Then every purchase or any billing plan prolongation made by this visitor within the unlimited period of time will bring you 30% commission of the price paid. We pay commissions for each sale over lifetime. You are guaranteed to receive your commissions from the user, that you led to us, even in case of payment from another device or by bank transfer. The user is assigned to you from the moment of his registration and this information stays with us forever. Learn more about SE Ranking Affiliate Program and try it in your accounts. Amazing news – we have added the option to integrate the SE Ranking’s Lead Generator with mashup service Zapier. Zapier is a mashup service that connects different apps together. The user can select two apps for interaction and create a Zap (trigger) between them as well as indicate the integration conditions. With Zapier, you can connect SE Ranking with various apps and services around the web. So all of the leads you are acquiring will be automatically uploaded to the tool that you are using – CRM, mailing services, task manager, Google services, etc. Get in touch with us and we will create a new Zap (trigger) for the actions you need. For example, if your rankings drop you can receive SMS-notification via integration with SMS-service in Zapier. Big and exciting news! We’ve switched to a new big data storage technology for Competitor Research tool. This means that now it works zillion times faster than before and we’ll be releasing the new country databases much quicker. We know you are as happy about this as we are! the total number of websites in SERPs for the exact keyword. A few more updates in our tools. We’ve added a validation check for traffic redirection from HTTP version to HTTPS. When the On-page SEO audit tool or the Website analysis module detects, that the redirection is not implemented correctly, the user is notified. 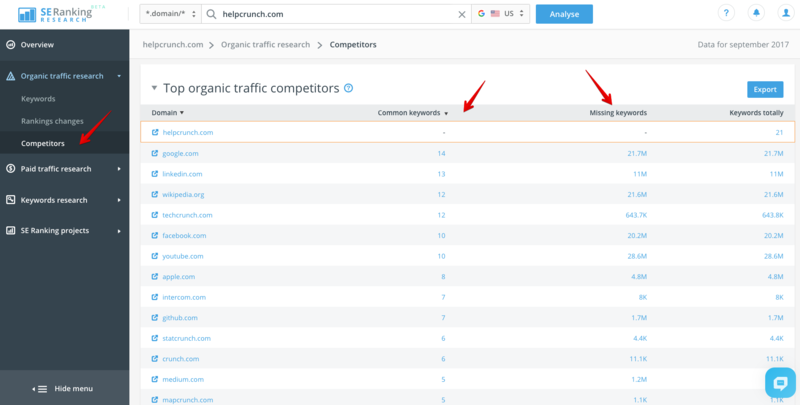 In the Backlinks Monitoring module, at the Pages section, users can filter the pages of the analyzed website by the number of referring domains. really gr8 article written as Zapier is a mashup service that connects different apps together.so it is very useful tool.